If you’re using cyn.in in your organization and have a support question, you can email, call or post a ticket on the Cynapse Customer Care portal - whichever is easiest for you. The open source community forums are a great place to get detailed solutions to technical issues you face while using the cyn.in community edition. And If you’re evaluating / using cyn.in and need a super quick solution to a problem, just tweet about it with #cynin or address it to @cynin. A Cynapse team member will surely respond to your query in real time with a solution. The Cynapse team has been actively using Twitter for a long time where we have conversations with thousands of passionate cyn.in users across the world. We listen to what users are saying about our product cyn.in, our company Cynapse and discuss their views on collaboration and Enterprise 2.0 software. Its a huge marketplace out there in Twitter and we listen to the word on the street, are on the look out for spontaneous unsolicited feedback about cyn.in and sometimes for tips on new business. For the uninitiated users, we use it as a channel to educate them about the all the great technological products that we are inventing and the benefits it brings to their business. 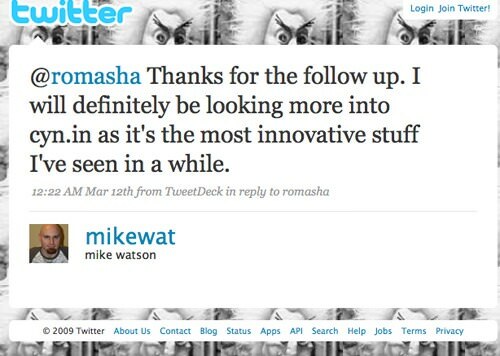 Everyday we find new ways to help our customers through Twitter … the possibilities intrigue us. Cynapse has 4 employees using Twitter actively, including the CEO and the CTO. Follow us on twitter, introduce yourself and interact with us.